You have the God-given power to choose. 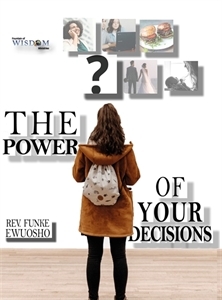 Your decisionshave the power to make or mar you. Your decisions not only shape your life;they also determine the final outcome of your life. “All’s well, that endswell”; no matter the circumstances of your life; you can also still makechoices that can reset the trajectory of your life and end well in life. Youmay not be able to change the past, but you can stop it from determining yourfuture! You’re welcome to this amazing teaching, that will equipyou to make the right decisions in life- even if you’ve made the wrong ones inthe past.